The blocks are ready. They are prepared, once again, to pile up, fall, be shared and questioned. The blocks will tell a story; a story of dreams and expectations. They will also tell a tale about of how unexpected circumstances and unplanned events can dramatically impact life. 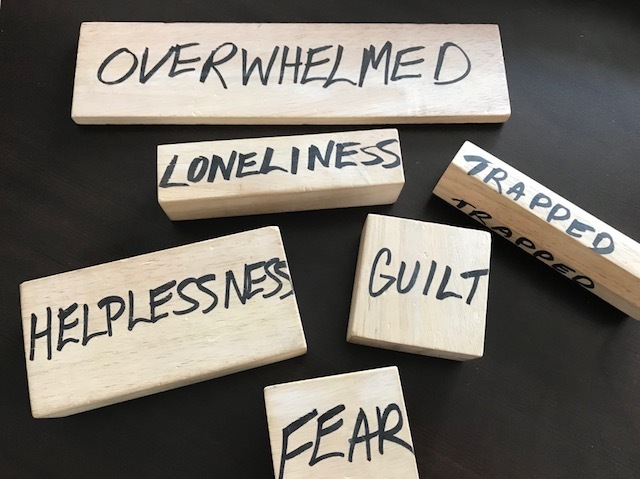 Today, the blocks will speak their powerful message to counselling professionals at the annual Ontario Association for Consultants, Counsellors, Psychotherapists and Psychometrists, where I will be doing the In a Family’s Shoes workshop. For this audience, I will take them on a journey of the significant milestones in my life, and what I have learned along the way. I will give them a chance to walk in my shoes and provide them with an opportunity to feel, go through and face what happens when life goes unplanned. It’s another opportunity to tell my story and to tell the story of others who are living through the twists, turns and detours of life. In a Family’s Shoes is an important learning experience for all human services professionals for it provides a greater appreciation and empathy for the true to life experience and emotional impact of the people whom they serve. Empathy is foundational for building bridges between individuals, understanding each other’s’ complex emotions, gaining a diverse perspective, and leveraging relationships for collaboration and progress. In a Family’s Shoes is a catalyst for further discussion on authenticity, building trust and exploring professional bias. It is a conversation starter, a foundation for exploring continuous improvement strategies such as improved problem solving, more positive relationships and a culture shift from benevolence to empowerment. The Harvard Business Review declared in January 2015, “Authenticity has emerged as the gold standard for leadership.” Today I will ask the participants to explore their values and beliefs for being an authentic professional and the impact that their actions have on the people whom they serve and support. It will be an exciting day, full of twist, turns and unexpected events; a walk in my shoes and in the shoes of others, creating another story to tell.